Be a Live SunSmart Ambassador. Raise awareness in your community about the importance of living “SunSmart” by organizing a fundraising event on behalf of the Live SunSmart Foundation. Our team will guide you through the process of creating a successful event that includes an event toolkit, checklists, press release templates and more. Contact us to begin the process of organizing a fundraising event. 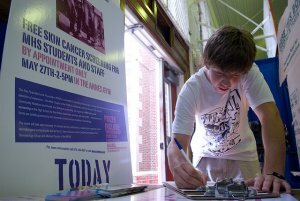 Organize your own skin cancer awareness program such as a health fair or skin screening throughout your community. We make setting up a public health and education program in your community easy by offering turn-key programs and tool kits for your use. Contact us to set up a skin screening in your area. Local Live SunSmart chapters are chartered by the Board of Directors as local vehicles for fostering our mission. Each chapter elects its own officers and plans its programs to reflect the needs and interests of its local membership. Typical activities may include regular meetings, coordinating skin screenings and information events, producing newsletters, general awareness, publicity and fundraising. Our high school chapters bring the work of the foundation to high school communities. Participation in a Live SunSmart high school chapter is a great to give back to your community and accrue volunteer activity hours. We encourage you to connect with your local high school chapter and to participate in the programs and activities offered. You must be a high school student in good academic standing. The volunteer chapter must be started within the high school either as a school club or permanent activity within a school club. The volunteer chapter must abide by the rules and regulations that govern student activities at the high school. A chapter must take part in a skin cancer and melanoma awareness activity at least once per academic year. Live SunSmart’s volunteer board and staff work closely with the leader of each chapter to establish effective, high-impact programs. Chapter leaders learn the fundamentals of launching innovative programs and are provided with ample guidance and training. Live SunSmart chapters are established only after an individual or group first applies to start a chapter, works with Live SunSmart Foundation to establish the chapter, and a chapter charter is signed by chapter officers and a Live SunSmart advisor. Contact us to start a Live SunSmart chapter in your area. The Live SunSmart name, logo and materials are protected by copyright and trademark laws worldwide. The use by unapproved groups of the Live SunSmart Foundation, logo and materials constitutes the infringement of our trademarks and copyrights, which carries the potential for serious legal consequences. Licenses to those important intellectual properties are available only to groups that comply with our organization's legitimate and appropriate requirements. Live SunSmart provides fun community events and fundraisers throughout the year. With the help of our partners, we host poker nights, galas, sports events and so much more to raise skin cancer awareness.